Sgt. John Figaroa and Sgt. Ricky Pickens-Wilson. 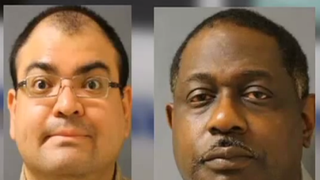 These two now-fired detention officers at Texas’ Harris County Jail are suspected of tampering with documents to hide the condition of an inmate’s jail cell. Pink slips are flying in a Houston prison after Deterrius “Terry” Rashad Goodwin, an inmate with a history of mental illness, was placed for several weeks in an unkempt isolation cell that contained dozens of food trays, “an infestation of gnats” and Goodwin’s feces, KRPC reports. Six officials at the Harris County Jail have been fired, and 29 other jail staffers have been suspended after an investigation into Goodwin’s 2013 treatment and the condition of his cell. Houston prosecutors say that two prison officials forged documents saying that they had inspected the isolation cell, but they had not. Prosecutors also say that at least 50 food containers were found in Goodwin’s cell, and shreds of his clothing and mattress were also found littered about. Two of the six jail officials who were fired—detention officers Sgt. Ricky Pickens-Wilson and Sgt. John Figaroa—are also the staffers suspected of falsely signing off on documents claiming that the cell had been inspected.